Mr Papafakis: Ruglund's ladz go for a stroll with their dog.....and blast some stuff too. Ruglund's ladz go for a stroll with their dog.....and blast some stuff too. 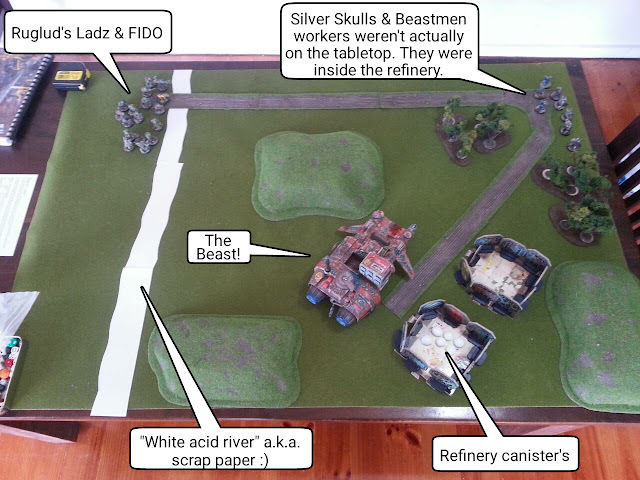 The second semi linked game with the Ork's that I played. Once again, my buddy came up the scenario & my son and I played the two opposing protagonist's. Silver Skull Squad Alpha Pappa (pushed around by my son). Your Squad has been sent to requisition fuel supplies (fuel canisters represented by six white tokens) from the Hazelburg B refinery and return it to the Governor's palace. You have been told that they are critical to the ongoing war effort, though you suspect it will be used to fuel the Governor's personal escape shuttle. Either way you've been given your orders and you'll carry them out. 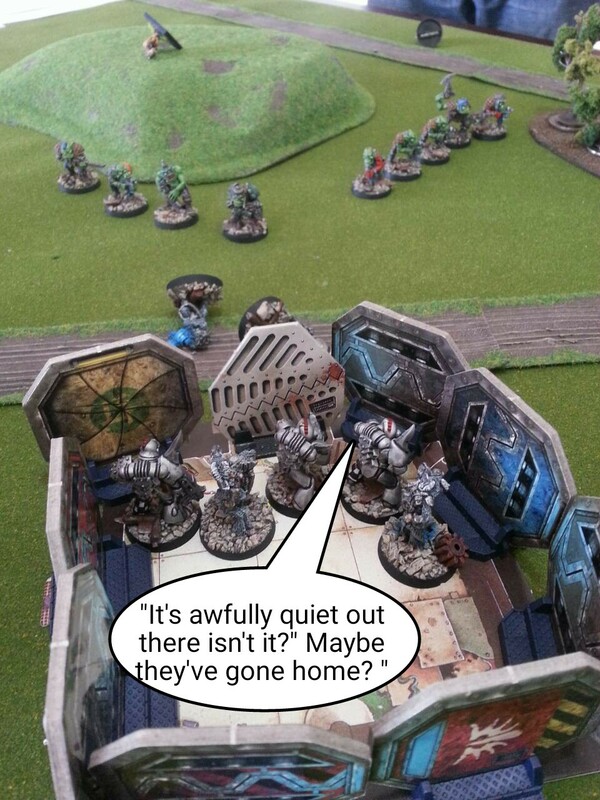 You must keep them out of Ork hands, either by holding the refinery or by moving them far enough away from the facility (off table) that the Orks will give up their pursuit. You have a transport you can use to carry the canisters away, affectionately named "the beast". But it's terribly run down, the weapon systems no longer function & the Grav systems are on the verge of breaking down. If you try to push it too hard it could stop functioning all together, so take it easy....you've been warned. Also, there's a rumour at the refinery that there's some sort of creature living nearby in a toxic lake (off the northern table edge). Making excessive noise in the general area could disturb the creature. 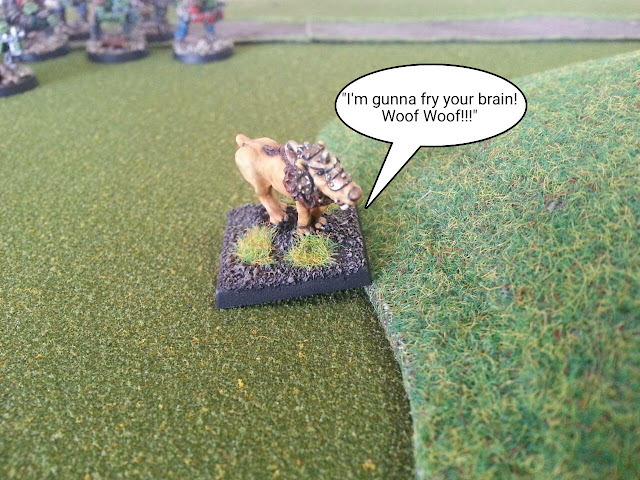 4 x Beastmen with lasgun's & their horns. 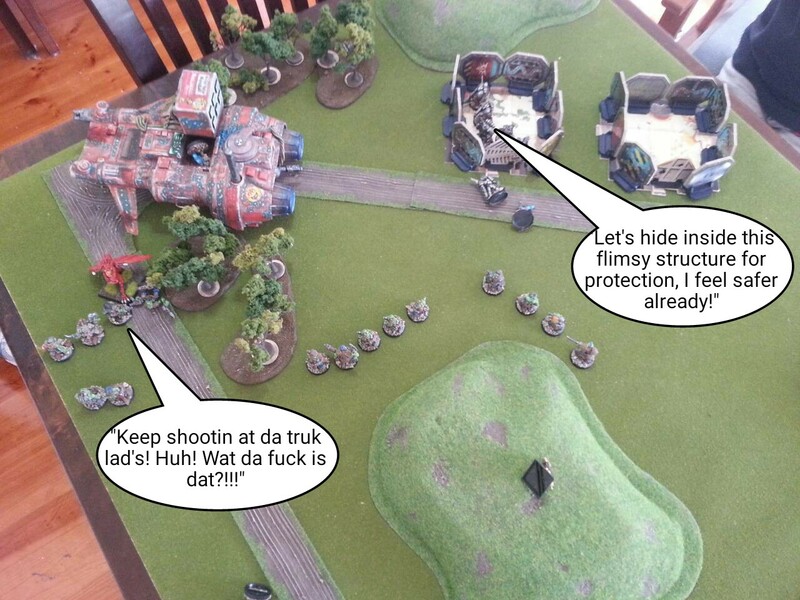 Youz invadin da humies turf. 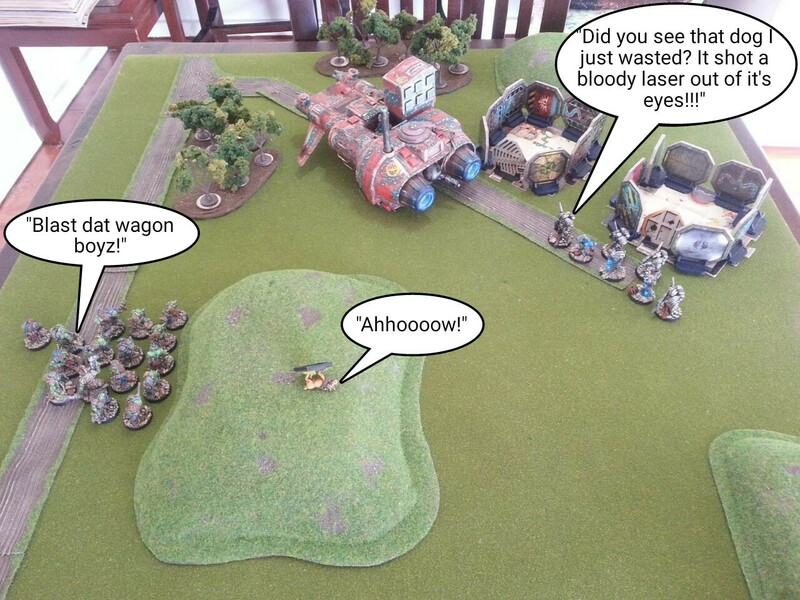 Dis is da first step, a speed bump on da way to da big battle where all da ladz from all da ova clans will join up an smash everfing real good. I'll be bringin me dog wiv me too (FIDO), nuffin can stop us wiv him helpin. Dis place has got da juice the humies need for their machines, wiv out it their stuffed. Take as much of it as you can. Maybe you can nick da humies ride as well? 15 x Ork Boyz with bolters. transport and immediately gunned the engine into overdrive. of the transport with Mental Blitz.....but failed. stir the "Swamp Dragon" from his slumber. As soon as it appeared on the roadside the Beastman operator attempted to ram it, but failed. 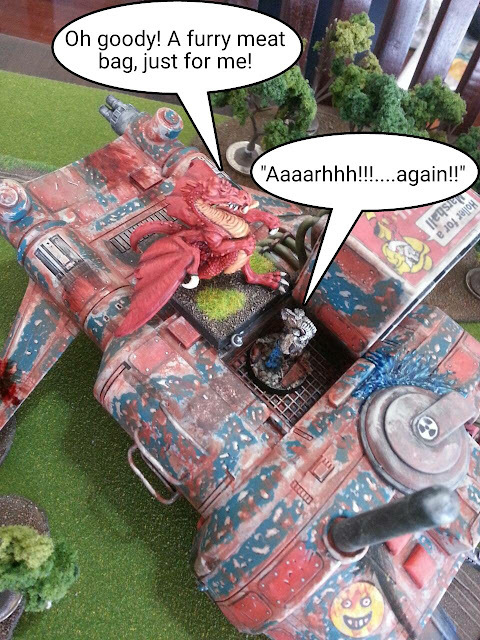 So the "Swamp Dragon" jumped onto the transport and ate the offending creature. 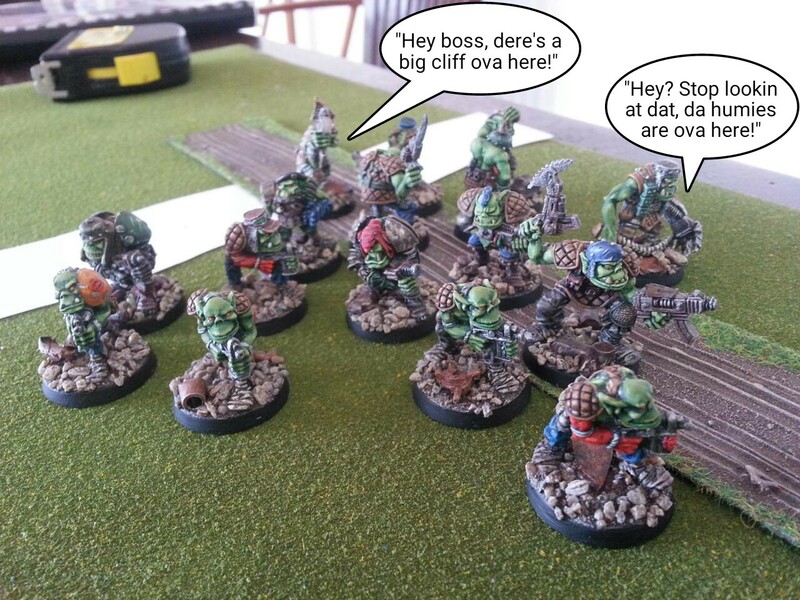 with the orks. 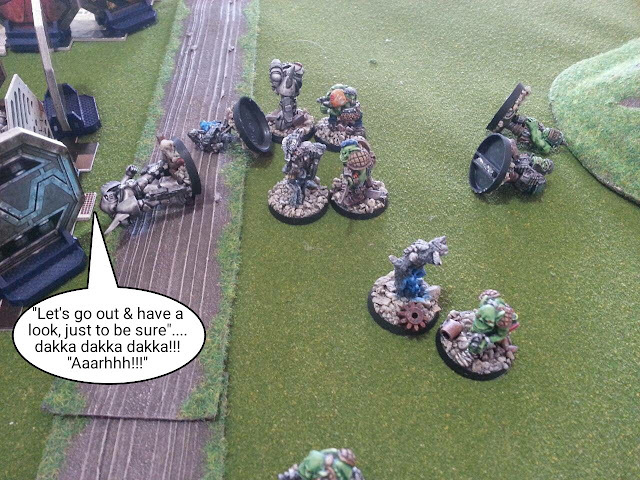 A Marine & Beastman were gunned down out the front of their shack. The rest made a hasty retreat. 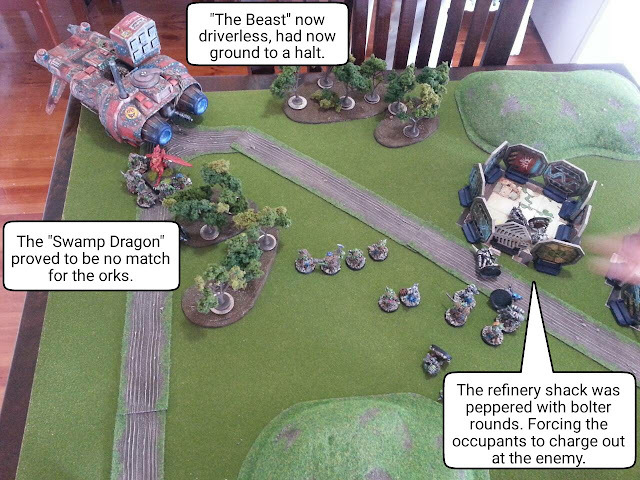 Turn four saw the remaining Space Marine force wiped out and the Swamp Dragon sliced & diced by Ruglud. The Space Marine's forces were completely overwhelmed by the orks. Maybe a few more could have helped, but the Swamp Beast was intended to tip the balance in their favour. Obviously it didn't turn out that way. Having a dog with mental powers was a fun idea, it's a concept that I'll try to incorporate into future games. The transport was a laugh, it started out with a max speed of 6 inches, but if driven at this speed then there was a good chance it could damage itself....which it did on the first turn. It's movement was slowed to an even slower rate of 4 inches. It then took damage from bolter fire, which made my son gun the engine at full speed again, slowing it further to a crawl. When the Swamp Dragon appeared and he tried to ram it with his "ram speed" it just casually stepped aside. After the operator was dispatched it just stopped. So, that ends game two. Lastly, I have a little bit of a dilemma that I hoping you guys might be able to help me with. I forgot to take photos for one of the games that I played while I was at home. I've got all the action written down, but I'm at a bit of a loss as to how I could go about doing a batrep for it without pictures. I can't recreate it either, as I don't have enough terrain to properly replicate it. Could you recommend an App that I could use to draw the battlefield? Or is there some other way of doing a batrep? Oh, and I forgot to mention that I don't have a PC, I do all my stuff on my trusty (sometimes infuriating) tablet. You could try using the map in roll20. I think that would work. I could give it a go if you want. Does it come with icon's & things like that I can use? 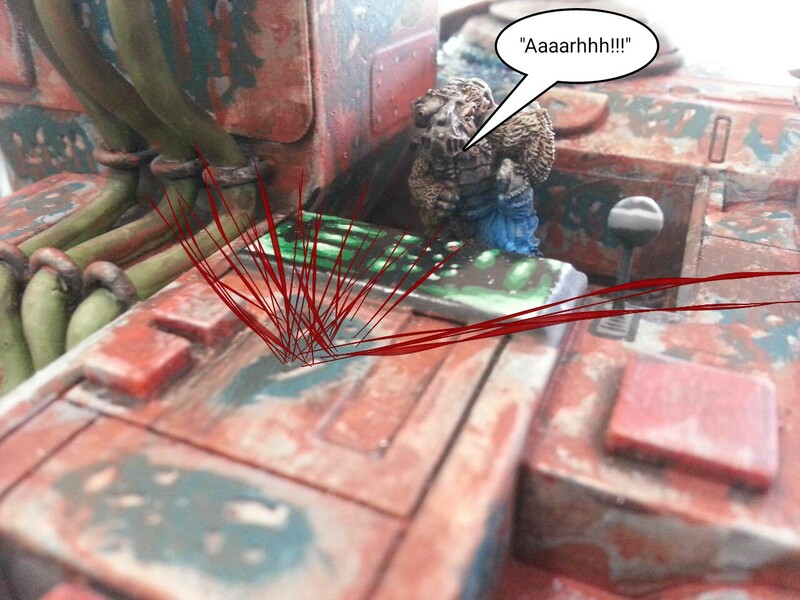 Something like the grav tank, ruined building's & different types of creatures...like orks and space marines? It comes with icons.some of them are sci fi, they might not be good matches but will do the trick. The terrain would work fine. I am fairly sure you can make your own tokens as well - so take a snap of a crusader bot and turn that into a token to put on the battlemat before taking a screen print... simple... haven't tried it myself but sounds simple. Ta, I'll have a play with it this week & see how it looks. 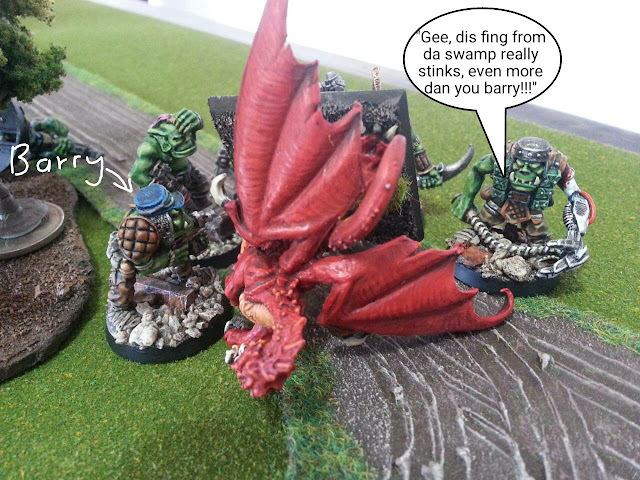 I have really enjoyed this series of batreps so far, the speech bubbles and photos work well for me. Very nice seeing your recent paint jobs in action, great stuff. You could always write a fluffy piece about your latest batrep, basing it on events from the game. Saves the need for graphics.. I really enjoyed getting to use them too. About the batrep, I might give that a try. I think I read one similar to that style done by Rab ages ago. A ROC report? Awesome! You're really making me want to break out the miniatures dude =) The special rules in this game really added to the narrative - it's always fun to have some kind of lurking horror sneaking about too. Barry is well known "bad arse" name isn't it? Yeah, I agree about the extra rules. Really makes the game pop l reckon. Glad you enjoy my "style" of batreping Suber. That game looks SO COOL it fried my brain. Woof woof. Seriously -- those gorgeous old orkies, that scenery, that scenario... it's right out of the frothiest imaginings of the Rogue Trader book. In terms of the photography -- yours look grand. I always find that taking pictures during my own games can distract from the actual gaming. It's like taking pictures while on a vacation... they can bring you out of the moment. Ideally, I like to stage photos afterword (the games, not the vacations), although that can't always work out. Anyway, keep up the great stuff! The next batrep will be a "drawing" job as I was remise in my photography habit during the game. I'm looking into some different types of drawing program's before I begin though. I'm glad you liked the report. The next one was fun, but the one after was a real corker. So hopefully you'll find both of them to be entertaining. Bring on Gandalf vs Dreadnaught!